Trailling by a single goal from the first leg, the one thing we couldn't afford was the loss of an early goal. Given the fact that this is precisely what happened was bad enough, but the manner in which Vitesse secured that early breakthrough can only be described as fortuitious in the extreme. It came in the tenth minute when Bart Latuheru's shot was innocuous enough until it struck Freddy Van Der Hoorn who was in the process of getting up after slipping. The ball careered aerially over the head of a stranded Alan Main and dropped agonisingly into the net. 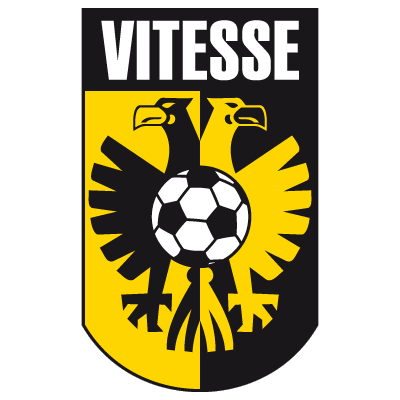 From that point we were always chasing the game and no one could claim there was any luck attached to Vitesse's second goal. Eijer broke at speed from the half-way line down the left and played the ball inside to Bart Latuheru who steadied himself before driving the ball past Main. Before the break a shot by Hamish French was saved by Van Der Gouw and the Dutch keeper was to be kept fully employed at the start of the second half as we made a storming start. All our pressure culminated in a penalty kick when Maurice Malpas was bundled off the ball after taking a return pass from Jim McInally. 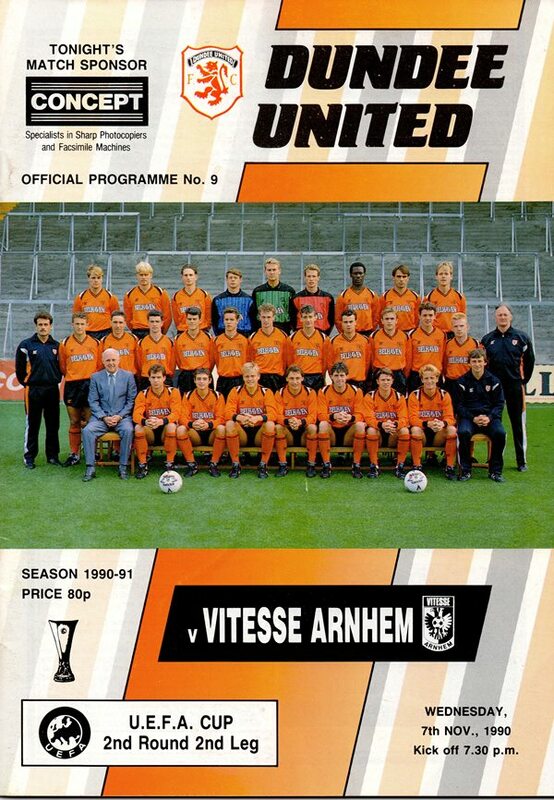 Unfortunately, any lingering hopes of a fight-back vanished when Mixu Paatelainen sent his spot-kick over the bar. It was the first time the Finn had failed from this spot since he came to Tannadice. Vitesse faired better from the spot 11 minutes later when Latuheru was brought down and Freddy Van Der Hoorn and John van der Brom converted. Rene Eijer completed a miserable evening with sixteen minutes to go when he sent in a viciously curling free-kick via an upright. This defeat was our worst at home in Europe, being the first time we'd lost by more than a goal at home and equalled our worst ever reversal in Antwerp a year previously. Truly it was a night to forget, with that fortuitous first goal largely to blame for transpired afterwards. The reaction to our recent defeat at the hands of Vitesse Arnhem was obviously one of major disappointment. There is no doubt in my mind that slack marking in defence plus failure in the most difficult part of the game, the creation and taking of chances, were precisely what let us down against the Dutchmen. Luck also plays a vital part. Certainly in recent matches against Celtic, Hibs and Rangers, we have collected two wins and a draw thanks to the breaks going our way at the right time. in the other side of the coin, however, the all important first goal which Vitesse scored was wholly attributable to a piece of good fortune for the Dutch. That early killer goal gave them all the confidence in the world and made it extremely difficult for us to lift our heads. Not that I am prepared to accept the loss of a flukey goal as an excuse for our heads going down. Despite that European setback I have no doubts that we have made tremendous progress this year compared to last, but time is one commodity you don't have in football and is an important factor as far as we are concerned. If you exclude Billy Thomson from the reserve side which played at Tannadice last Saturday, not one single outfield player was over 21. The average age, in fact, was 18% and yet they beat Rangers reserves 1-0 and they had the experience of Ginzburg, Cowan, Butcher, Vinnicombe and Dodds to call upon. But that doesn't tell the whole story of how much young players predominate at Tannadice. At Ibrox we had three teenagers in the 13 players involved in the game as well as Alan Main (22), Brian Welsh and Billy McKinlay, both 21. Consequently, we have a substantial number of players whose best footballing days are still to come. Our current need, therefore, is to improve the playing squad in the short term and give the tremendous nucleus of youngsters the breathing space they require to develop their game and achieve consistency. 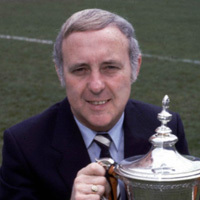 For this reason I spent the Friday before our match with Rangers abroad and Paul Sturrock then spent Saturday, Sunday and Monday on the continent, again looking for suitable players. 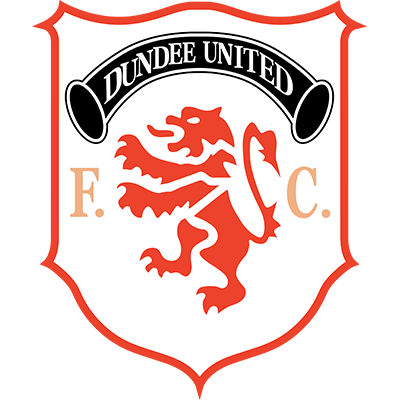 With the tremendous backing from the directors of the club, we are certainly doing our utmost to get players of a better calibre to Tannadice. If this happens it will be vital that others presently on the playing staff move on. However I can assure all our supporters that no player whom I think can make a major contribution to the club will be allowed to leave. For this afternoon's match we welcome a Hearts side which will undoubtedly be buoyed up after their win over Celtic last Saturday. We always find the Tynecastle side difficult opponents and I see no reason why today's match should be any different.